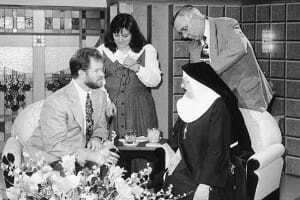 In a quiet apartment in Dayton, OH, I watched EWTN on a daily basis for most of 1994. Should I return to the Catholic Church, or remain a Protestant pastor? Mother Angelica helped to tip the scale toward Rome. Little did I know that in two years I would be with her on her set, first as a guest, then as her co-host for six years. Those six years at EWTN changed my life and I will forever be grateful for all Mother Angelica has done. I’m often asked, “what was Mother like?” Let me tell you a little bit about her. Mother Angelica was a woman of prayer and intense devotion to Jesus. She would rather spend a day in the presence of Jesus in a quiet chapel than stand in the limelight. If you have watched Mother on her many shows, you know her, because she was the same on TV as in the halls of EWTN. She was courageous, tenacious and holy. Her insistence on giving Jesus her best was at the center of every decision she made, and her unwavering faith provided a remarkable example to others on how a modern day disciple can live. I learned much in those six years with Mother. I learned how to trust God under pressure. Many times, when she called and asked me to accompany her on her live show, I would arrive at the studio to prep. With only minutes until we were on the air, I would ask, “what is the theme tonight?” She would respond with a casual, “we will see what the Lord wants.” I was nervous about going into a show with no theme, however, she was calm and confident that all would work out. Sure enough, when we went live, all turned out well. I learned from Mother that all the glory goes to Jesus. She told me one time that if anyone says anything good about you or praises you, point them to Jesus right away. I saw her do this time after time and I have tried to imitate her in this practice. One of the highlights was most certainly the day after she was healed in her office. For over forty years she was in a body brace and used leg braces, the result of an accident back in Ohio. On January 28, 1998 she was completely healed as a result of praying with a woman after her Wednesday show. The next morning, she called me and asked me to come to the parlor, a place where cloistered nuns meet with family and receive gifts. It was early in the morning and I was anxious to see her after hearing the news the night before. As I entered, all the sisters were standing with her and she spun around like a young teenager. I was speechless. She asked me if she could come on “Life on the Rock” that evening to tell the world. I said, “Mother, it’s your network, you can do anything you like.” That evening, she told the world what happened and gave glory to God. I don’t think of myself as a dancer, but that evening on live TV, Mother asked me to dance with her. What do you do if you are a layman on live TV and Mother asks you to dance? You dance! And we did! Today, Mother is dancing with Jesus and enjoying her new home in heaven. A lesson we can all learn from Mother is that God can do amazing things with the five loaves and two fish that we have. She didn’t have much when it comes to TV experience, but what she had, she gave to Jesus and he did amazing things with it. Every time I hear the story of the feeding of the five thousand, I think of Mother Angelica and the five loaves and two fish that she gave Jesus. If you have been blessed by EWTN, then you have benefited from her gift to the Lord. To work with this great woman of God is counted as one of the highlights of my life and her generosity became one of the most significant pivotal points in my life. From me and my family, we thank God for you Mother Angelica. Get your favorite Ascension content sent right to your email! Life On The Rock was the first (i believe) EWTN shows, via the Internet, that I started listening to before returning to mass after 20+ years away from regular attendance. What a blessing Mother was (and is) and also you and your show on EWTN back in the day. It was funny to join the confused when the “Lord Of the Rings” movies first came out and they were referring to it as LOTR. I also thought they were talking about Life On The Rock. God bless you Michigan_Pat. I am with you as Mother also blessed me and will always be in my heart. You made me chuckle for your reference to LOTR…lol! Take care and keep the faith! We will miss you Mother Mary Angelica….you brought me back to the Catholic faith and I owe my gratitude to EWTN and your love for God’s children. We’ll be together in heaven, because of your love. Thank you Mother and everyone who serves God through EWTN! Mother Angelica also changed my life. She led me back to Confession after many years and through her and the Holy Spirit I received God’s mercy in such a powerful and amazing way. I have been forever grateful. I just love the image that she is dancing with Jesus. Thank you Jeff for sharing your story. Mother Angelica brought me back to the church after 15 years. I was watching her show one night and I felt like she was looking and talking only to me. I went to confession and started going to mass again. I will be forever grateful to her for bringing me back to Jesus. She will be dearly missed. May she rest in peace. Another Beautiful memory of Mother Angelica! I have read so many of them today. God Bless you Jeff and many your life be eternal in the hands of God, Mother Angelica! I am 65 years old, and just had my first Communion and Confirmation this Easter. It all began when I surfed across “The Journey Home” on EWTN. Thus, I owe my newfound faith to Mother Angelica. Most impactful to me is praying the Rosary with Mother Angelica. She makes it a truly 3-D experience ! Love to her as she continues her ministry from another studio ! God bless you! Praise be to God for your coming home! I first came across EWTN on Internet through Ascension Press in 1997. Though I could not access everything as I worked in UAE, I liked the news and articles on Faith. I have used T3 Timeline with teenagers. Mother Angelica has been inspirational for me and I have a number of her shows which I use in Catechesis. Thank you Jeff for your tribute. What clinched her comments this morning were no more than a handful of really incise, pertinent points. Anyone in her listening audience —lax Catholics, secularists, atheists ( .. she didn’t USE these terms) —would miss, LOOSE OUT enormously, FATALLY, if they kept wandering around with grossly erroneous ideas of, or Unbelief, in Heaven. It brought sharply to mind the experience and insight of Ste. Therese of the Child Jesus, during her last days of sickness (Sept. 1897). This iron-willed little Norman Nun ( ..Therese!) was permitted to experience WHAT IT WOULD BE LIKE to NOT believe in God, to LET GO her belief in Heaven. The seriously ailing Therese received up-front knowledge of what an atheist feels. And, yes, she too clearly saw and felt the path to suicide .. but THERESE REFUSED to let go her indomitable conviction ABOUT HEAVEN. Funny! .. today, when atheism is even popular, and when States are allowing —PROMOTING —suicide in law, the two still stick together : No God? No hope. Life AIN’T worth living. Pain and discomfort are THE enemy. STOP THE WORLD AND GET ME OFF !! Not so for Mary Mother Angelica! .. uh, uh! .. no way!! .. no Cross? no love .. no suffering ( IN UNION WITH THE SAVIOUR .. UNTIL TIME IS NO MORE!) ? .. no Love. So, my question squirrelling around under me brain these days has been: Bishops, have you MISSED your opportunity ?? Rarely, other than Venerable Fulton Sheen, have I heard even a whimper out of Bishops ( .. and their Priests!) “unpacking” the power of the Cross, its necessity as found, and accepted, and lived with, and for, and in Christ. “Offer it up!” remains as true as ever. Because, outside of the Cross, suffering and pain make no sense. And atheists would be right. But they’re not! .. Pope Francis demonstrates THE RIGHT BALANCE (.. truth, compassion, mercy, personal discipline etc.) in today’s compelling issues of unbelief, suffering, and violence. Although a cradle Catholic, it wasn’t until I decided to nix the typical daytime TV shows as a younger stay at home mom, and only have EWTN on as my Lenten devotion (we were a military family living in Guam). I owe so much to EWTN! While listening to programs while ironing, tending to my boys, cooking, cleaning and the like, I was brought to an understanding of the faith like never before. A true conversion! I was bathed in Truth and couldn’t get enough! This was at a time when I was thinking of joining the church of my lovely protestant friends! Thank you Mother Angelica! May all who have been touched by her work be filled with the grace to live the Truth that others may also come to the fullness of the Christian faith! I would love to see the “Life on the Rock” episode where Jeff and Mother Angelica are dancing! Born and raised a cradle Catholic in a 100% Puerto Rican family, I am in my late 40’s and am very sorry and shameful that I didn’t take more time to watch EWTN. After Confirmation in the early 80’s, our church didn’t really have any high school youth ministry groups that attracted me and my siblings to attend. Yes, I still attended Catholic mass weekly during college, but it wasn’t until after I got married and started raising a family that I started to delve deeper into my Catholic faith. The parish I belong to here at OLPH in Ellicott City, MD has been an instrument in helping me raise my 3 kids in the Catholic faith. My husband and I will be married 20 years this year and he has been attending Catholic mass with me ever since we were dating 23 years ago. He is not Catholic but I have been praying regularly for his conversion. My girlfriend of almost 40 years sent me a link of a timeline of Mother Angelica’s life and I must admit, she appeared to be such an incredible woman. I hope to use EWTN programs to help me continue to bring my kids up in the Catholic faith and most importantly help my husband fully convert into the Catholic faith. Thank you Mother Angelica for all that you did while you were here on this Earth and happy to know that you are now in a place with the one you most adored! Mother Angelica was very influential in my faith story. Her network along with her audio cassettes brought rebirth and awakened my spiritual life in the very early 80’s; I could not get enough of her. Mother Angelica came to Niagara Falls in May of 1986. She spoke to 1000 people in the Gallagher Center at Niagara University, as well as, praying over all despite the brace on her leg that went up her back and the constant pain she was in. As a result of her appearance and many signed petitions Mother Angelica and the EWTN Network was able to be broadcast in the Niagara Falls area. What a wonderful experience for myself and many others to be a part of. Mother had great love for the young people, As I recall that was the reason why she came to NF. Youth group encountered Mother “A” in Stubenville, Ohio at a Youth Conference and came back “on Fire” and deeply loving Mother; she understood their problems. You were their “super hero”. Thank you Mother for all you have done to bring Christ into the life of so many, young, old and in-between. God truly used you in a very powerful way. If ever Mother is ever declared a Saint of the Church, she must remember for her role in Catholic Media and Evangelization. Love you both! You have both changed the direction of my spiritual life. Praise be to God! Copyright © 2019 Ascension Press. All rights reserved. Learn what the women on the way to Christ's tomb signify, how Emmaus prefigures the Mass, and how to best accept the risen Christ. Sign up for our email list to get it FREE. This guide lists Scripture in an order that is easy to understand. Sign up for our email list to get it FREE.